A Day to Remember premiered “Naivety” today on BBC Radio 1. A Day to Remember will be premiering a new song on BBC Radio 1 tomorrow. More details can be found below. Victory Records has issued a statement on their current lawsuit with A Day To Remember after frontman Jeremy McKinnon spoke with Kerrang. It can be found below. I warn you, it’s hard not to read it in Donald Trump’s voice. A Day to Remember are about to release their long-awaited new album, Bad Vibrations, on September 2nd. I spoke with the band briefly on the third annual APMA’s red carpet. A Day to Remember have released their new song “Bullfight.” The album’s release date has also been pushed back to September 2nd. A Day to Remember have announced their world tour dates with Of Mice & Men. You can find those below. Also, I’m usually a little bit more “in control” of the whole album. But on this one we worked with Bill and Jason. I took a step back and let Bill steer the ship. He really did produce this album. I remember the first day we were there I sat down with him and showed him every single song idea I hadn’t finished since I started saving them. I was there with an acoustic guitar and sang him probably a hundred songs that I thought were great but just couldn’t finish. Ninety percent of that stuff no other person had ever heard before. And, yeah, he hated most of it (laughs)! It really set the tone. But I think we’re better friends and a better band because of that process. 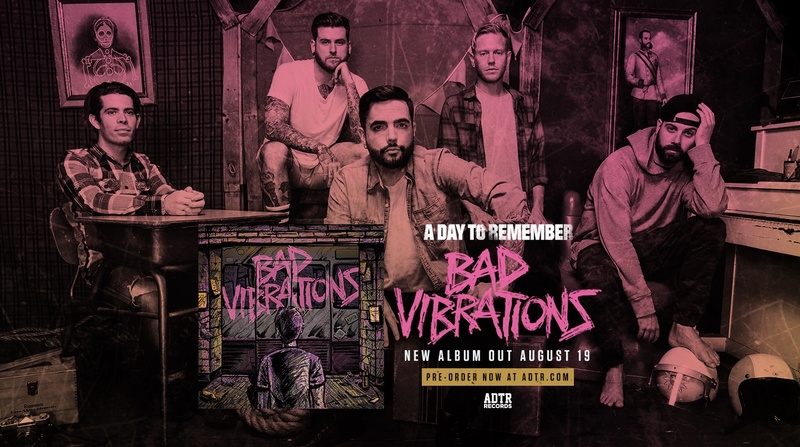 A Day To Remember have announced that their new album, Bad Vibrations, will be released on August 19th. A music video for the title track is now available on their website along with pre-orders for the album. The band is also gearing up to play the Kerrang! Awards in London and headlining the APMAs in Columbus before joining Blink-182 on their summer tour starting July 21st. A Day to Remember’s Homesick and What Separates Me From You have both been certified gold. Congratulations to the band.